After 4 years of painstaking development and prototyping, the Platypus underwater exploration craft’s final design has been unveiled. Designed by Van Peteghem Lauriot Prévost (VPLP), a French naval architecture firm, the Platypus is a twin hulled craft that can navigate on the surface of water as easily as it does beneath the waves. 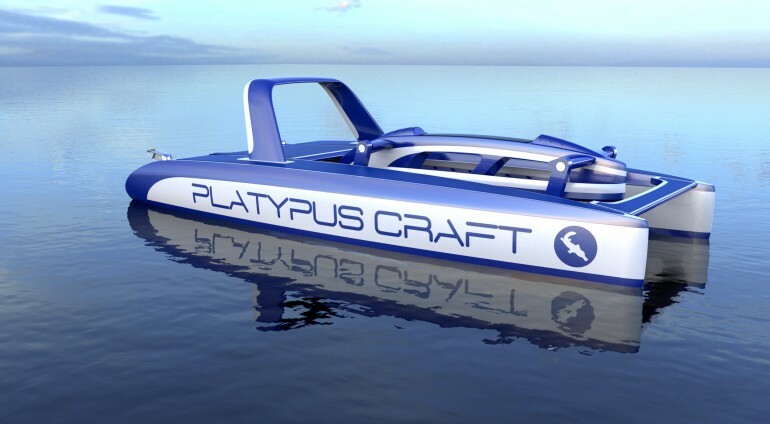 Designed to be an open platform, the Platypus’s two pontoons not only keep the craft afloat while cruising but also contain the air compressors that supply oxygen to its passengers while submerged. According to VPLP, the craft’s final dimensions, 5.7m (19ft) long and 2.5m (8ft) wide make it small enough to fit inside a 20 foot shipping container but still large enough to carry four passengers. Equipped with two outboard motors, the Platypus has the option of using three different drive chains, two of which are electric. The first powertrain gives the Platypus a 40km (25 mile) range with a max speed of 5 knots. The vessel’s second powertrain option ups both the range and speed of Platypus to 48km (30 miles) and 10 knots. In its final configuration, the Platypus would have an 80km (50 mile) range and a top speed of 14 knots, making it more than capable of taking on any underwater pleasure tour.